Zhen Xu participated at Coup de Ville 2013. This text was published in the catalogue. Zhen Xu’s career started in the 1990s at the time when the Chinese art scene and economy unmistakably began to make their mark on the world. Xu did not shy away from criticising the sacred institutions of social conventions. Even less did he spare the art world, whereby, for instance, the star artist Damien Hirst became his target. He responded to human (over-) sensitivity, the dramatisation of existentially vulgar events in order to arrive at disruptive or provocative works. For instance, he dealt with a variety of socio-political topics and taboos within the globalised world – which China has a growing role in shaping. ‘The starving of Sudan’ in which he addresses the limits of voyeurism, photojournalism and the lack of ethics in the globalised world, is no exception to this. 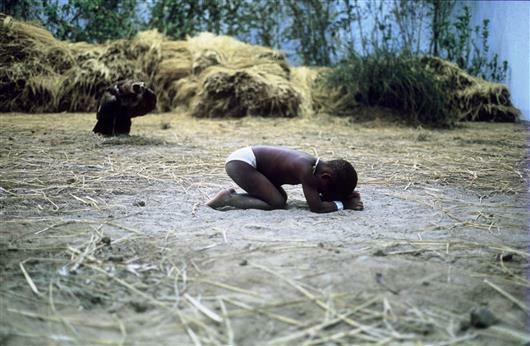 ‘The starving of Sudan’ concerns a remake of a photograph taken by the South African Pulitzer Prize winner Kevin Carter in 1993: an abandoned toddler is threatened by a colossal vulture in the barrenness of the Sudanese desert. Despite winning the award, this image generated untold resentment and reinvigorated the discussion about ethical norms within photojournalism. The photographer was condemned by the international media for his amoral standpoint, in which his desire to shoot a moving image took precedence over helping someone who was in acute mortal danger. Buried under masses of criticism, Carter committed suicide a few months after receiving his award. Xu recreated this situation in a gallery under controlled, fake circumstances. Five hours a day for 21 days, a three-year-old girl from Guangzhou, China, originating from African immigrants, sits in the staged setting. Her mother received financial compensation and remained nearby her child and the stuffed vulture. A series of photos and a de-mystifying video still remain of this ‘performance’. 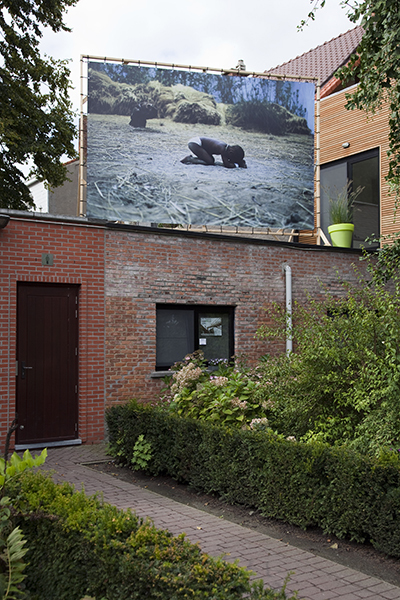 A blow-up has been made of one of the images for Coup de Ville and has been placed in the public space. The location was formerly a children’s cemetery when child mortality in was still a frequent cause of death in Europe. Not only does Xu continue to focus on coming to grips with the issue of image consumption and voyeurism, he also raises questions about Chinese economic ambitions in Africa, to which the rest of the world also remain an accessory.